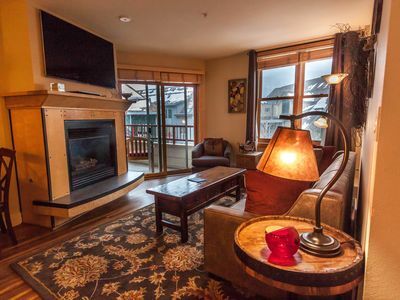 Welcome to The Pinions at Eagle’s Nest in beautiful Silverthorne, CO. Our 3,200 square foot log home is tucked below the stunning Gore Range and nestled along the Raven Golf Course. 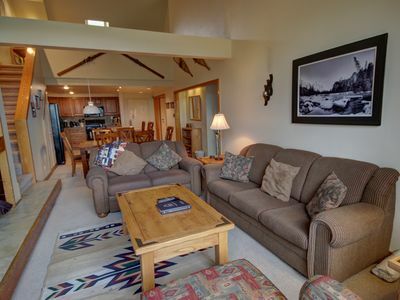 You can sit inside, on the deck, or in the hot tub and take in the spectacular views of the Blue River Valley, as well as the surrounding mountain ranges, including the Keystone Ski area and Ten-Mile Range. The home is equipped with everything you need for a wonderful vacation. 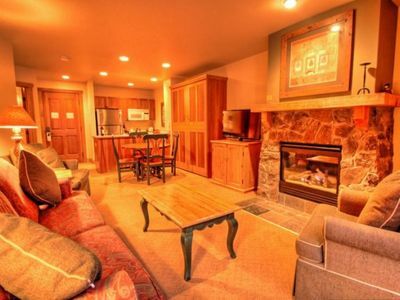 The main floor great room has vaulted ceilings, log cabin details, a fireplace, and cozy but plentiful seating. The adjacent kitchen has Sedna slab granite countertops, a breakfast bar, and is equipped with everything you need - a real gourmet kitchen. The dining space is tucked into an octagonal nook with spectacular views from every chair. 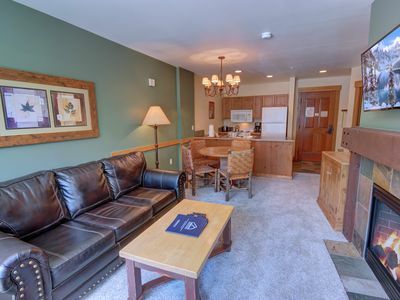 We also have a second family/recreation room downstairs with adjacent dining space, air hockey/billiards, and wet-bar. This provides additional space for the kids or to enable some privacy for larger groups. 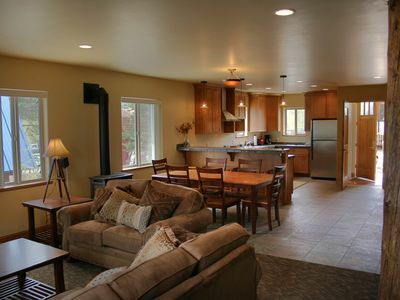 We have four bedrooms and four bathrooms, plus a loft, with plenty of space for two or more families. Everything is upgraded, designer-decorated, and thoughtfully appointed. The abundant outdoor space, including the Arctic Spa hot tub provides even more places to relax and enjoy the views. There is so much to see and do in Summit County. We are famous for world-class skiing. 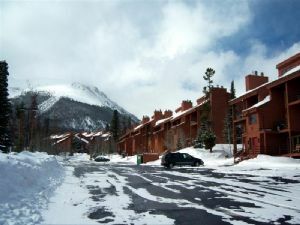 The home is 10-15 minutes from Copper Mountain and Keystone, and a few minutes further drive from Breckenridge, Loveland, A-Basin, and Vail Ski areas. 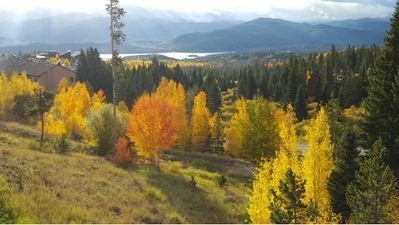 The summers are just as fun as the winters – hiking, biking, rafting, fishing in the lake across the road, shopping, and music festivals are common activities. We would be honored to have you as a guest at The Pinions. 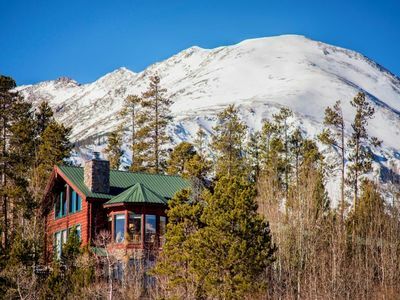 The home is located in Eagle’s Nest, tucked below the fabulous Gore Range, with spectacular views of the Keystone mountain ski area, Ptarmigan Wilderness area, Ten Mile Range, Gore, and the Continental Divide. The property is tucked within the award-winning Raven Golf Course community. 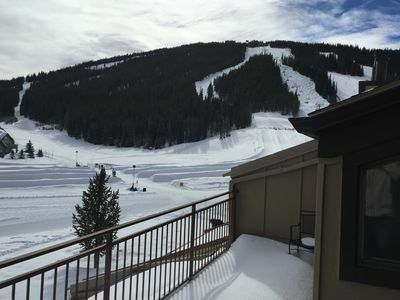 The home is located within 15 minutes of Keystone and Copper, and a few minutes more to Breckenridge, Vail, and Beaver Creek. The property adjoins and overlooks acres of open space, providing for a convenient and quiet location. 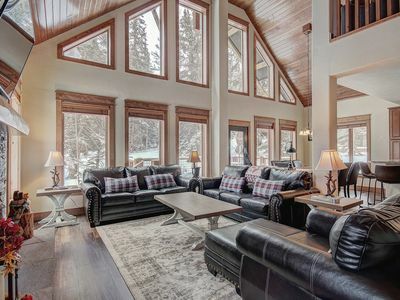 The home is a beautifully appointed, well-maintained log home with over 3200 square feet of living space. After you step in from the cozy front deck, the entrance warms you immediately, down to your toes, with in-floor and baseboard radiant heat. 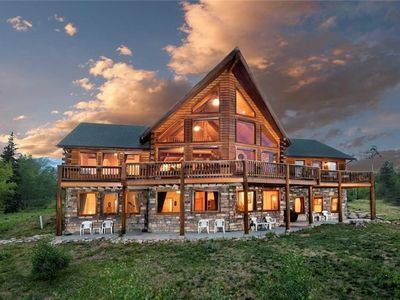 Throughout the home, there are large windows and vaulted ceilings, with log cabin details, maximizing views in every room. The heart of the Main Floor is the great room, which is flanked by the kitchen and dining area and overlooked by the loft, creating a warm and open feel. The dining area holds a round table capable of seating 8, which is surrounded by floor-to-ceiling windows with spectacular views. 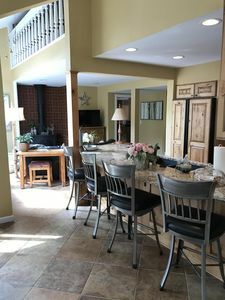 The kitchen, which has tongue & groove knotty pine ceilings, Sedna slab granite, a breakfast bar that seats 2, and stainless appliances, opens to the dining area & great room. 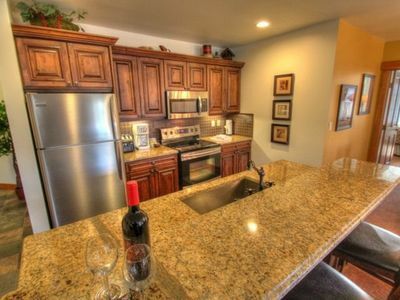 The kitchen is outfitted with all the amenities of home, stocked to accommodate larger groups. There is an extra foldaway table and 6 chairs available to accommodate additional diners, so larger groups can dine together if you choose. Although we can accommodate events, We respectfully request that you pre-approve with us any parties/events with more guests than you are listing on your reservation request. Off the dining room, there is a large Trex deck overlooking the Blue River Valley. You will want to enjoy a beverage at the custom, folding, bar-height table with 4 bar stools. Here you will be protected and slightly shaded by the surrounding aspens and pines. On the main level, mahogany hardwood flooring grounds the cozy seating area. 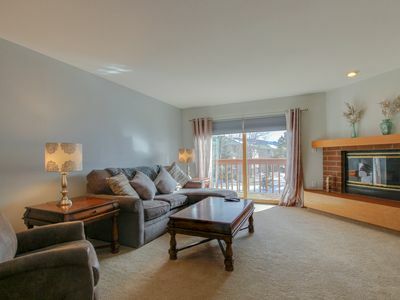 The family room has a new, gas fireplace that can heat the room, surrounded by slate rock and log finishes. 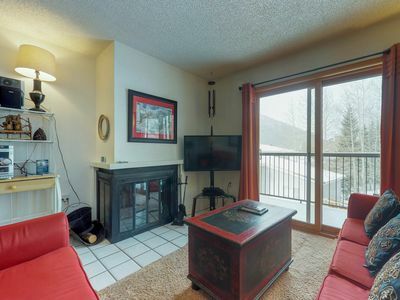 There is a large TV with cable over the fireplace, but it is not the focal point. The seating can accommodate larger groups, yet still feels cozy. The vaulted ceilings reveal a 300 plus Sq Ft loft that combines an office with bonus space and a Queen Sofabed. To access the space, stroll up custom painted log stairs. The office and home is 100Mbps Wi-Fi enabled, so you can work while you enjoy the amazing views. Downstairs, there is an additional separate family-media room with Comcast w/Netflix/Prime Video, DVD, Wii Gaming System, Air Hockey/Billiards Table and an adjoining dining area and wet bar with wine refrigerator. The space has its own new, stone-surrounded gas fireplace that can heat the area. The space is perfect for families who want some grown-up time and space, separate from the kids. 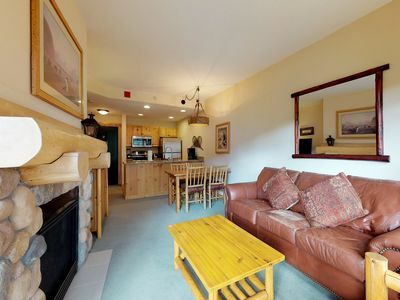 There is a spectacular 1000 SQ FT patio with log railings accessible off the downstairs family room. 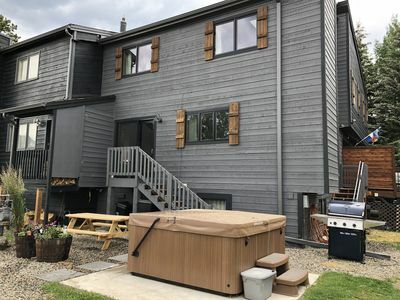 The patio has abundant outdoor seating, including 2 chaises for lounging, and the ultimate lounging spot in a hot tub with abundant jets and seating for 6. The house has 2 floors, the first of which is handicap accessible. Each floor has 2 Bedrooms and 2 full Bathrooms. The main floor Master Bedroom has a King sized bed and a newly remodeled Master en-suite Bathroom with a huge walk-in shower, custom finishes, and a second washer/dryer. You will awake to lovely views from this room. The second bedroom, also on the main floor, has a Queen bed and en-suite bathroom, which is handicap accessible and is also accessible from the main floor hallway. You can see Peak One (10-Mile Range) from this room. Downstairs, the 2 bedrooms share one newly remodeled adjoining Jack and Jill full bathroom with alder cabinets, double sinks, and Quartz counters. There is also a separate full bathroom just down the hall from the 2 bedrooms. The newly renovated hall bathroom has a washer and dryer as well. 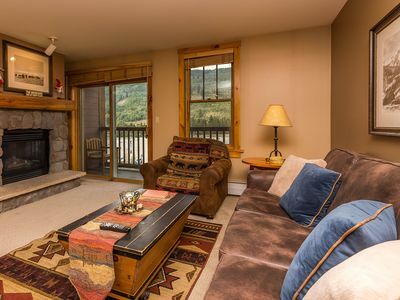 One bedroom includes a King-sized bed with nice views of Aspens - the room includes a seating nook as well. The other large bedroom has 3 bunk beds, perfect for larger groups. Two bunks are twin-over-double, and one is a twin-over-twin. The bunk room can sleep up to 6. 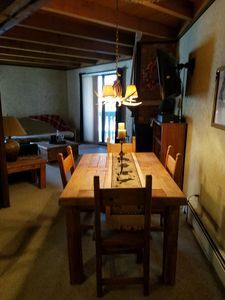 There is a large attached 2 car garage with work space and handicap access, with plenty of room to store skis, boots, and other equipment. There is outdoor parking space for at least 2-4 more cars. 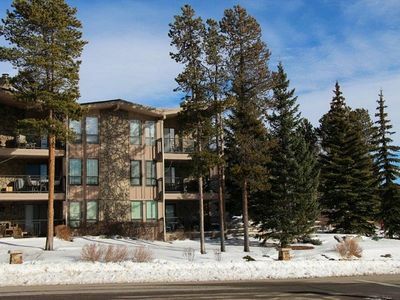 The home is 5 minutes away from the Silverthorne Recreation Center with Sauna, Hot Tubs, Swimming pools, Water slide, Indoor track, Exercise Room and Gym. There are many other summer and winter activities in the Summit County area. Access to hiking and biking trails is steps away- the Eagle's Nest Trail runs through the neighborhood, in fact. 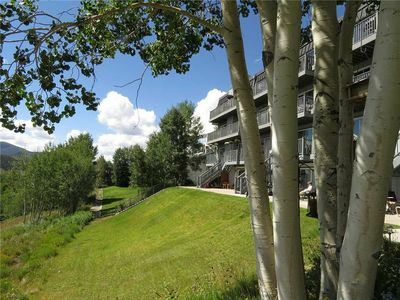 White water rafting, snowmobiling, snowshoeing, horseback riding, and golfing are within easy reach. Silverthorne Factory Outlets are 5 minutes from the home. Hot Sulfur Springs is 45 minutes north of Silverthorne. Glenwood Canyon and Springs is 1 hour 20 minutes west. Although you can easily cook a gourmet meal in the well-stocked kitchen, you may want to try one of our favorite restaurants in town. Sauce on the Blue is our new favorite (the brussels sprouts are amazing! ).